Maybe it was your grandmother, or your mother, or an aunt or a neighbor. 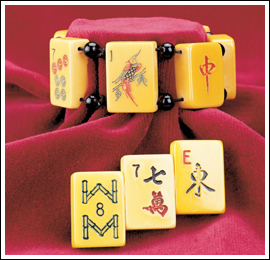 Perhaps you knew someone who played Mah Jongg, or saw it on TV. The decorations and designs had meaning within the game, but it's their artistry that makes these tiles stand out. Our designer continues to buy up original Bakelite game tiles and has crafted these unique conversation-starting accessories. The bracelet has spacer beads, and stretches to fit most wrists. The brooch has 3 tiles on a safety-clasp back. Please note that these are original amber and cream color tiles, so designs will vary.